It is difficult to miss adult male yellow headed blackbirds (Xanthocephalus xanthocephalus) with their black bodies, bright yellow heads, white wing patches and black masks. Females and immatures present more of an identification problem. Recently I was watching dragonflies along the shore of the Tule River (Shasta County CA) when this yellow headed blackbird flew near. I was surprised to see a yellow headed blackbird because I believed most of these birds had already left for their wintering grounds in the Southwest and Mexico. A female or an immature male? 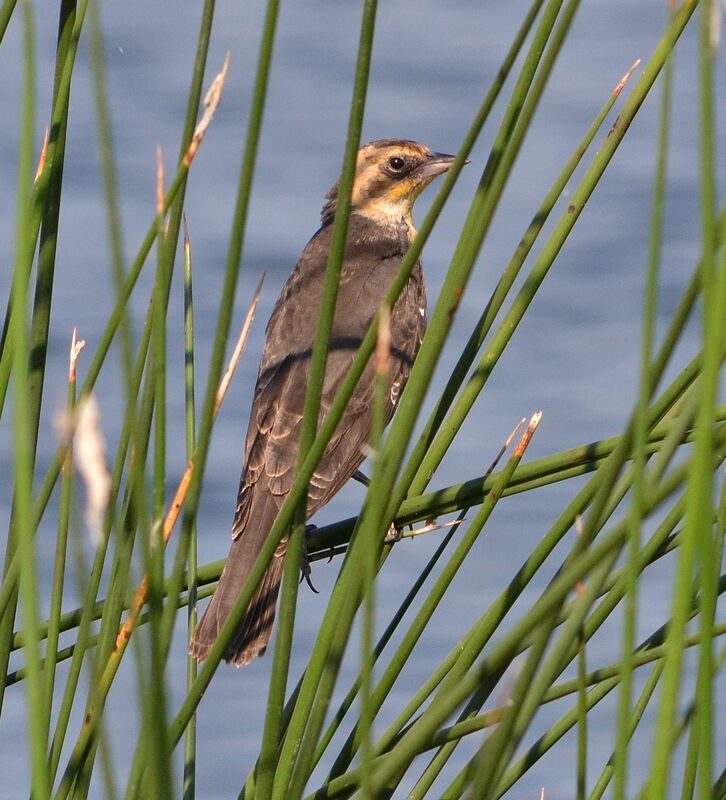 Female and young yellow headed blackbirds have brown instead of black bodies and the head is a much duller yellow (even tawny or buffy) with varying amounts of “smudging”. However, two characteristics lead me to believe this is an immature male: first, immatures have some golden or buffy edges to their wing and tail feathers, and second, young males show varying amounts of white at the bend of the wing. The white may not be fully developed into the wing patch of an adult male, but females do not have white feathers on their wings. Looking at the picture closely, some white is visible on the wing and there is a golden hue to the feather edges. If he has not already, this lone young yellow headed blackbird now needs to find his way to warmer climates because we already had our first hard freeze of the season last week. This entry was posted in Birds and tagged nature photography, Xanthocephalus xanthocephalus, yellow-headed blackbird. Bookmark the permalink.